Today’s weighted blankets and ASMR were yesterday’s snore balls and Ovaltine. For as long as insomnia has plagued our great nation, entrepreneurs have been hawking cures from pills to pillows. Today’s weighted blankets and ASMR were yesterday’s snore balls and Ovaltine. In spite of our best efforts, a report from the National Commission on Sleep Disorders Research estimates that overall sleep time in the U.S. has decreased by 20 percent in the last 100 years. Though our approaches to sleeplessness are ever-changing, the pages of the Post prove that, for more than a century, manufacturers have been thinking up new ways to woo people into slumber — or at least make a few bucks trying. Before the mattress innovations of the 20th century, brands like Wilson & Co. and Ostermoor boasted their top-notch quality beds made from cotton and… “curled hair”? That’s right, the Restgood Sanitary Curled Hair Mattress — from the company that makes your tennis rackets — was stuffed with animal hair. The meatpacking man Thomas Wilson broadened his manufacturing focus in the early century to include sporting goods, luggage, violin strings, and mattresses. All of these products reduced waste from the slaughterhouses. Try not to let it keep you up at night. Insomnia was “the great destroyer,” and the remedy could be steaming hot beverage. Malted beverages, hot cocoa, and even (decaffeinated) coffee were promoted to calm the mind and aid in digestion, affording drinkers a restful night and nerveless morning. 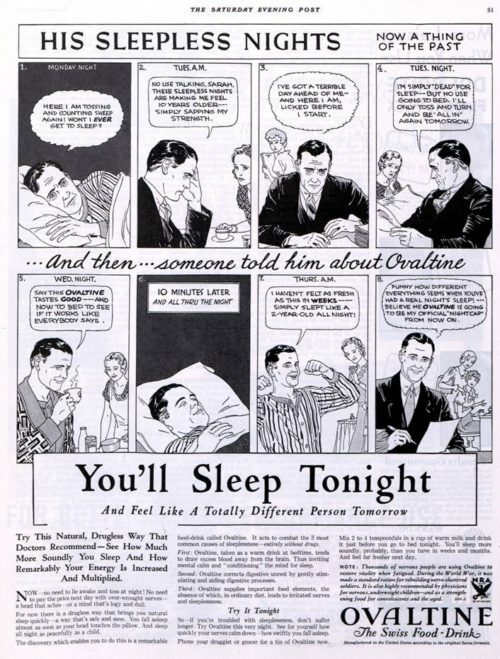 Comic advertisements like Ovaltine’s appeared often in the early century, reflecting common anxieties around city-living and careerism. Without fail, the product in question would allay maladies, like sleeplessness, that affected the man of the home and, in turn, the whole family. Though innerspring mattresses had been in existence for decades, they gained popularity in the 1930s. “They ‘breathe.’ They are always ‘alive,’” one Simmons ad claimed. Less lumps and a longer life meant the bed would remain a winner for consumers for years. Even now, a spring mattress is a top choice for all kinds of sleepers. Originally created for work horses, the topical pain reliever Absorbine Jr. was easily branded as a sleep aid, since back pain could be blamed for many a sleepless night. It appealed to the desire for a “natural” remedy with “no doping” involved. And if a lack of z’s could be blamed on indigestion, perhaps Phillips’ milk of magnesia was the cure. Even before the glory years of DDT, insecticides were peddled to keep bugs out of our way. The bedroom was a place where gnats and mosquitoes were most unwanted. What’s the use of buying that expensive curled hair mattress if flies are buzzing around it all night? Oh, to attain that elusive slumber and to “sleep like a baby.” Nevermind that most babies wake up shrieking every three hours to be fed. Still, the peacefulness of a sleeping child evokes all we could ever want for our own shut-eye. 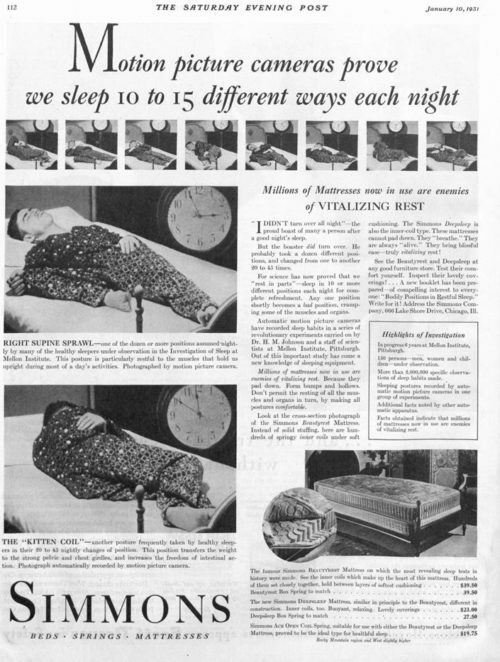 In 1942, the story “How to Get a Good Night’s Sleep” featured cutting-edge inventions and curiosities for sleep aid from the Lewis & Conger Sleep Shop in New York. “Snore balls” attached to a person’s head and whistled if they rolled onto their back. The “heartbreak pillow” absorbed a night’s worth of tears for the inconsolable. The shop even sold a “long-distance smoking tube” for customers who needed that last puff at bedtime. 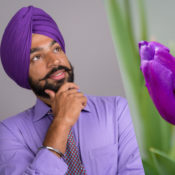 The war fit nicely into a sales pitch for companies who could claim to be doing their part. Pullman was a giant of sleeper car manufacturing and operations, and — the year this particular ad ran in the Post — the company was hit by an anti-trust suit that forced it to divest interests. Still, Pullman was a major manufacturer of small ships for the war effort starting in 1943. The Department of Justice split up the company, but it was the advent of air travel that sealed Pullman’s fate. Seventy years later, stretching on a real bed while zooming to a destination doesn’t sound half-bad. The “miracle science of electronics” was finally being put to use helping people sleep. But electric blankets had been around for decades. In the ’20s, they were a dangerous oddity used on tuberculosis patients in sanatoriums. After some development, “electronic blankets” hit the market that came with thermostats and safety features. 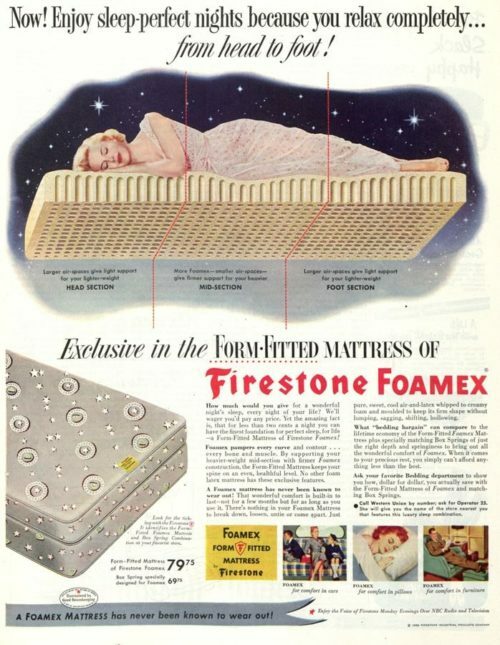 The first foam mattresses were made by the country’s trusted names in tires, Goodyear and Firestone. Before the popular “memory foam” was invented, these beds boasted “pure, sweet, cool air-and-latex whipped to creamy foam and molded to keep its firm shape without lumping, sagging, shifting, hollowing.” The familiar comforts of horse hair would lose out to new, futuristic luxuries like “foamex.” The Space Age was rapidly approaching, and a wealth of new products would dramatically reshape the way Americans lived — and slept. The Ostermoor and Wilson mattress ads are very interesting. I read every word of the ad copy, and it seems pretty state-of-the-art for the 1910’s. despite the strange stuffing of animal hair. Maybe it wasn’t strange 100 years ago. We weren’t there then, and in all fairness shouldn’t judge too much. The later Simmons ad showed great leaps toward the spring mattresses we’ve used ever since. Now we get to the beverages. I’m a little skeptical drinking cocoa before bedtime would really help put you to sleep, but again, can’t judge. Same with the Ovaltine, and even more so with the Sanka. Their abilities not withstanding otherwise, shouldn’t liquids be cut off (say) 2 hours before ‘retiring’ so you don’t have to get up later once you are asleep? The Absorbine Jr. ad approaches sleep from a pain relief aspect which no doubt applied to a lot of people. I found the Fly Ded ad meant well, and probably was effective in killing these bugs as stated; but have to wonder what affect it had on the people’s health otherwise. It kind of scares me in that regard Nicholas, sorry. Then we have the Big Ben Westclox ad using the cute, sleeping baby to help sell it. A cute baby is one of the oldest, sneakiest sales tricks in the book, and still works to this day! The snore balls and other gimmickry probably worked in some cases. The long-distance smoking tube is kind of appalling, but a lot of people then probably needed one, and some now. Whether that would have saved Jack Cassidy’s life in 1976 is something only God knows. I envy the man’s sleep in the Pullman ad most. Zzzzz. Love the ad for the Simmons Electronic Blanket. Very close by ’46 to the electric blankets we use now. I turn my ’91 or ’92 Sunbeam electric blanket on high about a half hour before getting into bed, then dial it down. I love the round dials going from 1-22. It works great, and have no reason to replace it, at all. Don’t you love the electron running through the word ‘Electronic’ here? I sure do!